Third to be released for the year, the Lucy Hayes First Spouse Gold Coin honors the wife of the 19th President of the United States. Following the specifications of the series, the coins are struck in one-half ounce of 24 karat gold. Lucy Hayes was a strong supporter of the temperance movement and banned alcohol from the White House during her husbands administration. While First Lady, she and her husband celebrated their 50th wedding anniversary at a ceremony held in the White House. She also began the tradition of hosting the Easter Egg Roll, an event that is depicted on the reverse of the coin minted in her honor. 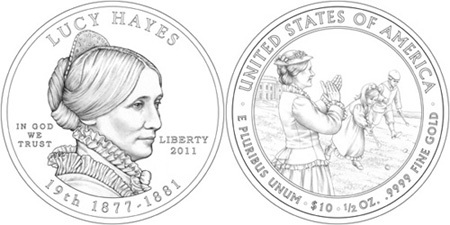 The obverse of the Lucy Hayes First Spouse Coin features her portrait, as designed by Susan Gamble. The required inscriptions including her name, “In God We Trust”, “Liberty”, the order of the Presidency, the dates of the term, and the date of issue appear surrounding. Depicted on the reverse of the coin is a scene from the first Easter Egg Roll held on the grounds of the White House. It was estimated that several hundred children attended the event. The reverse shows Lucy Hayes cheering on two children. Inscriptions indicate “United States of America”, “E Pluribus Unum”, the face value, weight, content, and purity of the coin. The estimated release date for the coin is September 1, 2011. Details of the release including the pricing and maximum mintage are yet to be announced.